It has been just over a year since the city’s $1.6 million bike lanes opened on Cannon Street, and the route is busy: – in the peak summer months it was seeing 500 to 600 trips a day, the city says. But with all those new riders, so too come crashes. It has been a year since the city's $1.6 million bike lanes opened on Cannon Street, and the route is far from empty – in the peak summer months it was seeing 500 to 600 trips a day, the city says. But with all those new riders, so, too, come crashes. There have been 20 more total collisions (involving bikes, e-bikes and cars) on Cannon Street since October of last year than the five-year average on that stretch, statistics show. In 2013, there were six collisions that involved a bike or e-bike on Cannon – since the bike lanes went in and ridership numbers grew, there have been 26. The rising number of crashes speaks to a need for driver and cyclist education, says David Ferguson, the city's superintendent of traffic engineering. But the overall numbers on ridership are "encouraging," he says. "Even though the number of crashes have increased, the overall volume of users has increased too," Ferguson said. "I see all kinds of users on there – people who are riding to work and otherwise. You want to encourage active transportation." The city used a "tube sensor" implanted in the lanes to measure how many trips were being taken on them. That sensor doesn't measure individual riders, so the city can't say exactly how many individual people are using the lanes. The city didn't set a "benchmark of success" for ridership numbers before the project started, so there isn't a standard to compare those numbers to, but Ferguson says they should be seen as a positive. – Source: City of Hamlton, Oct 1, 2014 to Sept 30, 2015. Ferguson says that of the collisions reported on Cannon since the lanes went in, it's more often the case that cyclists have been at fault and "disobeying the rules of the road." "There are incidents where cyclists are running red lights and stop signs," he said. "There are also some incidents where drivers aren't yielding to cyclists." But collisions aside, if the goal is to get more people out and cycling, it's happening, Janet Simons told CBC News. Simons is a resident physician who routinely uses a Sobi bike to get to work at Hamilton General Hospital by using the Cannon Bike Lanes. Before the lanes went in, she drove. "It's really great. I definitely feel much safer there," she said. "I definitely feel more inclined to cycle." The city's next bike lane projects are slated for Highland Road and Bay Street. 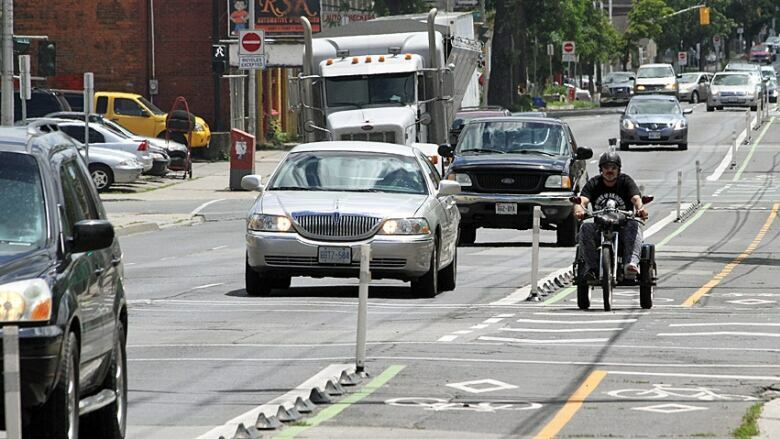 Are complete streets losing steam at Hamilton city hall?